Back in the days when computing was just starting to take off. Microsoft rocked the PC market with their graphical interface, Window 3.1. Since then we have come a long way. With Vista and now Windows 7 on the horizon, we see windows come a long way. On the 1st of November 2008, Microsoft officially stopped issuing licenses for the software that made its début in 1990. 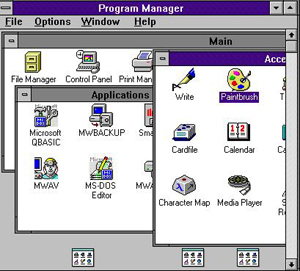 Windows 3.x was very popular as they were the first of Microsoft’s operating systems that had a Graphical User Interface, AKA GUI. Microsoft maintained support for Windows 3.x until the end of 2001. It has lived on as an embedded operating system until 1 November 2008 - mostly used on some of the Virgin Atlantic and Quantas long haul flights to power the in-flight entertainment systems. The specs of Windows 3.1 are something to look at with greed and envy. 8086/8088 process, XT or or better that had a clock speed of up to 10MHz. Graphics card that supported CGA, EGA and VGA graphics. Compare that with Vista specs, and you're amazed. I remember the hit it had, as well as the difficulty it caused. Learning to use the mouse as a serious input device. I remember seeing people use two hands on their mice in an effort to gain control. What about the graphical games like solitaire. Few people know that solitaire was actual a game which was meant to help with the honing of your mice skills. I got my wife, to start playing solitaire to perfect her mouse skills. Some thing that I regretted later on as she became totally addicted to the thing. What are your memories of Windows 3.x? Good or bad. Will you miss it? Windows 3.x. Rest in peace.